1 of 4 In a large bowl, mix together nonfat dry milk, malted milk powder, chocolate milk powder, cocoa powder, sugar and cinnamon. Sift into another large bowl. Sift again into the first bowl. 2 of 4 Spoon mixture into a 1-quart canning jar. Gently tap on counter a few times to settle ingredients. 3 of 4 Place lid on jar and decorate as desired. 4 of 4 To present as a gift, include in a basket with a bottle of coffee-flavored liqueur, cinnamon sticks and chocolates, if desired. 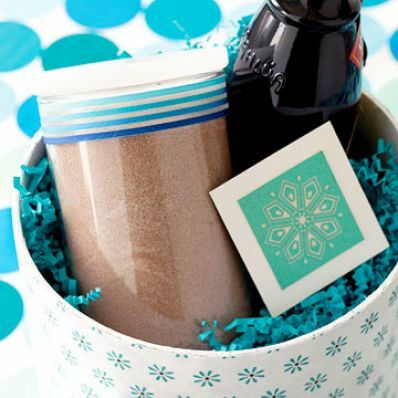 Attach a gift tag with the instructions for preparing by the cup. Cocoa by the Cup: Place 1/3 cup of mix in a coffee mug. Pour 8 ounces boiling water into mug and stir. Per Serving: 297 kcal cal., 265 mg sodium, 3 g fiber, 2 g sat. fat, 9 mg chol., 4 g Fat, total, 65 g carb., 7 g pro.